The TV duo tell Philippa Gerrard why finding the right spot remains crucial when buying a new property. They explain the common mistakes house hunters make, how sellers can make their home stand out and what is happening with the market in the north-east. First of all, is location still most important? P: We always say location is the most important. A lot of the time people are very specific about the type of house they want and very specific about the location. But what we tell them is that you can’t be too specific about both else you’ll be looking forever. K: To me a house is supposed to be a home, a shelter and a place of solace. If you pick the wrong location, you end up spending more time travelling to and from the house than you need to, whether it’s getting to work or taking the kids to school, etc. That means less time at home. In my opinion it doesn’t matter what a house looks like on the outside – stick with the location. Spending more time at home and less time commuting is going to make you far happier in the long run, even if it’s just half an hour extra in bed in the morning. What are the most common mistakes people make when house hunting? P: Not comparing like for like. Lots of people use a bit of a scattergun approach, comparing different prices, different locations, different house sizes and try to evaluate them all equally. K: Or people look online at properties and call that house hunting. Houses are one thing you can’t shop online for, you need to see them in person. It’s just like paint colours – everyone knows they look completely different on your lounge wall than they do on the website. P: We get so many people saying that they would never have viewed a certain property if they had just seen it online and more often than not that’s the house they end up buying. Prices have dropped significantly in Aberdeen in the last few years. How is the market holding up? K: House prices in Aberdeen really have taken a hit in recent years compared to what they used to be. It’s something you’ll often see in different cities when a big local employer takes a hit – there is no question it will affect the local property market. Aberdeen in particular is an example of that and really proves that there is no such thing as an average national house price. What can sellers do to make their home stand out? K: The usual advice I give to people is to de-clutter and tidy up. But strangely enough, houses in Scotland are far cleaner and tidier than most houses on the market in England. That might be a controversial opinion but from my experience it’s true and I’ve seen it time and time again. P: For me the best piece of advice I can give is not to underestimate the importance of the front of the house. Potential buyers won’t see your fancy kitchen and luxury bathroom if they can’t get past then untidy exterior and scruffy garden. K: That links into online advertisement, too. You need to make sure the best picture of your house is the first one that online viewers see. No point in having the best picture hidden away because buyers will just scroll past you. What advice can you give buyers looking for a bargain when it comes to negotiating? K: Bargains are rare when a house is first put on the market. Where you’ll find a good deal is on a house that’s been for sale for a while already. Often the price reductions can be substantial, meaning that it won’t be marked-up and you can offer a decent price. P: Don’t be afraid of negotiations either. Abroad negotiations are a totally normal part of buying and selling houses, but in Britain we are often reluctant to get involved. Another tip is to really consider the value of a house. Valuations are not an exact science and do be aware that there are thousands of houses on the market which are often overpriced. K: Do not be afraid to try your luck. The worst thing that can happen is they turn the offer down, then you can always try again. What’s the most beautiful house you’ve ever seen in Scotland? K: We have seen some really amazing properties over the years but some do stick out. 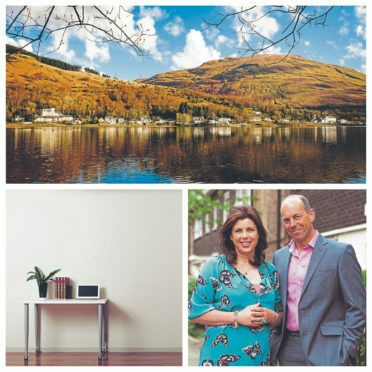 P: I remember the very first episode of Relocation, Relocation ever made and we went to the shores of Loch Long on the west coast and saw a house in Arrochar which was just stunning. K: You know I bumped into the owner of that house last week. I was out jogging and they stopped me and asked if I was Kirstie Allsop. It’s a small world. P: People still ask me now how we found that house, you know. It was just in the most fantastic spot looking over the loch. And they got it all for half the price of the two-bed flat they sold in Twickenham. Really it was to die for. K: It’s on a fairly main road that we’ve been on a few times since while out looking for properties so we see it all the time. Maybe we should pop in for a tea next time. Ever fancied your own home in Scotland? P: About two years ago I saw a house advertised on the Isle of Lewis and it was just stunning. I really started looking into it and was quite keen to put in an offer. A couple of days later I got into the car with Kirstie and she was on the phone to her husband about a property and it turned out she was talking to him about the very same house. We wanted to go for it and make it a shared holiday home our families could use but in the end the exact location was a nightmare for us to get to so we had to pull out. K: I love spending time in Scotland. My sister has a house on Jura, which is just lovely. I’m coming up to Caithness in August to do a tour of the Castle of Mey then spending some time renting a fisherman’s cottage in Wick before going down to the Fringe Festival in Edinburgh. P: I’ll tell you what, though, somewhere I’ve always wanted to go but never been is Arran, so that’s next on my list. 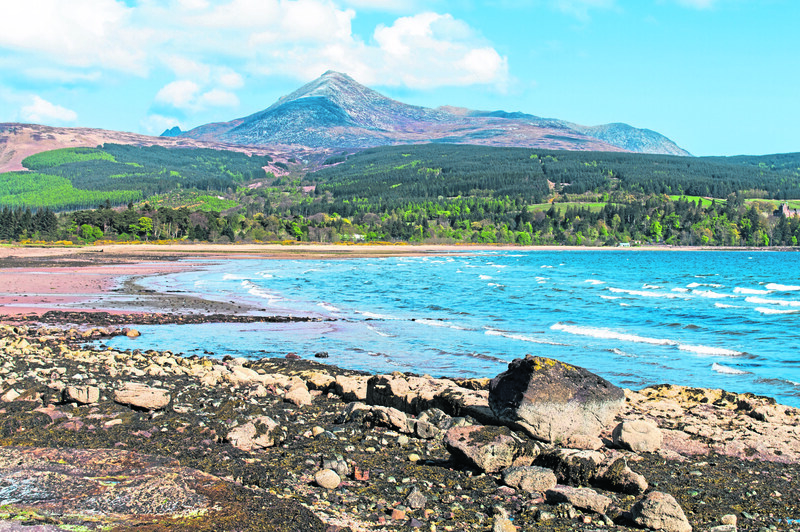 Goatfell and the Isle of Arran are on Phil’s list of locations to visit in Scotland. P: Building a new house is much easier than trying to carry out renovations on a historical property which is already there. K: I agree and would certainly build my own place if the right plot of land came up. At the moment you’re promoting the use of smart meters. Tell me more about them? 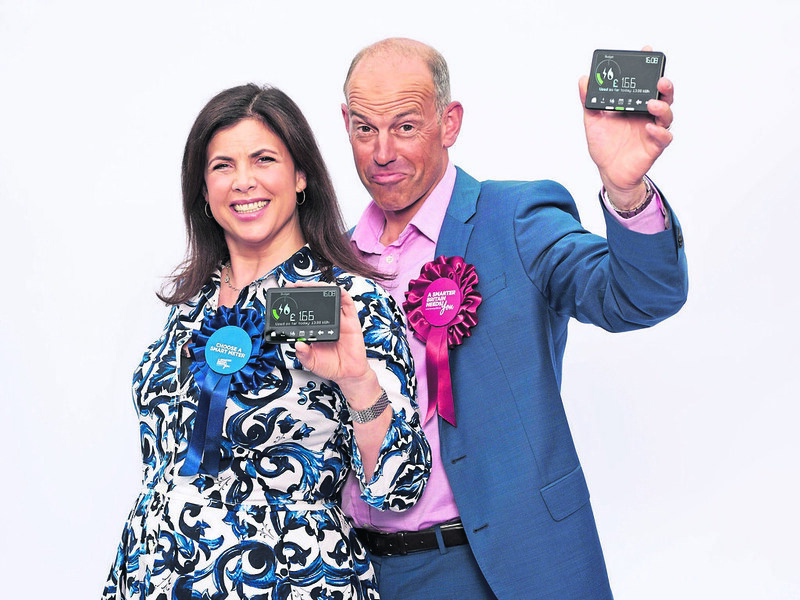 Kirstie Allsopp and Phil Spencer kick off their smart meter campaign for Smart Energy GB in London. K: Personally I’ve done quite a lot of work in recent years around various environmental issues. Working to reduce plastic waste for example is so important but we need to work on other things like reducing energy waste too. But to be able to use less, you need to know how much you are using in the first place. Smart meters make it easy to track how much energy you’re using and give you far more control. It’s so easy to save money when you know what you’re looking for and in my experience you end up getting competitive with yourself trying to stop wasting energy needlessly. P: Everyone wins really – you save money by using less energy and society wins because less energy is needed overall. Are there any ups and downs to smart meters? P: Your energy supplier will give you one free of charge, so it’s a no-brainer for me. K: It used to be that the meters didn’t work off of a standardised system so each energy supplier had a different way of doing things. That meant that when you changed supplier you also had to change your meter. They are working out all the kinks like that now so it’s a great time to get one – particularly while they are free and can save you money.